Link House by Bassenthwaite Lake Guest HouseOnly a short walk to the beautiful shores of Bassenthwaite Lake, this country house enjoys stunning views of the forests and surrounding fells including Skiddaw, Britain’s fourth highest peak. Katie and Pete have just bought this is a comfortably furnished guest house, which maintains a relaxed, homely atmosphere. En suite facilities are available in all 7 of our bedrooms. 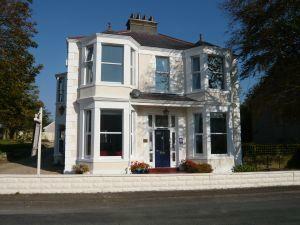 All bedrooms are equipped with tea/coffee making facilities, flat screen TV and hairdryer. Many of the period Victorian features have been retained downstairs. The guest lounge combines a warm, cosy feeling with wonderful views over Sale fell. Breakfast is served in the light and airy conservatory which enjoys views over open fields. Ideal in spring with the lambs are to be seen. A private, free car park to the rear of the property allows safe off-road parking for guests. Cycle storage and drying facilities available. A full Cumbrian, continental, smoked salmon ( with a choice of eggs) or porridge breakfast is included in our rates and wherever possible fresh, local produce is used. Stunning views of Skiddaw, 450m from the hotel. Children welcome from any age. Link House by Bassenthwaite Lake sometimes limits bookings to 2 or more days. Views of fells/forest/garden. Large bay windows, double glazed spacious room. Our best value room. This can also be booked for sole occupancy at a discount of £20 per night. Views of fells/forest/garden. Double glazed spacious rooms. Bath and overhead shower. Room 7 sometimes limits bookings to 2 or more days. From the M6 jct 40 take the A66 west towards Keswick. Continue on the A66 towards Cockermouth, with Bassenthwaite Lake on your right. At the far end of the lake is a short stretch of dual carriageway. Take the first right after the dual carriageway signed Dubwath & Castle Inn and follow this road as it bears round to the left. You will see Link House on the right-hand side, about 300 metres from the turning.